physical energy, mental sharpness, fatigue, attitude , posturing and feeling … and they are often common with life events, sleep, exercise , and sunlight. Simple charting tools like these can be useful for the dialogue with one’s doctor on the next visit — or for one’s own health awareness. 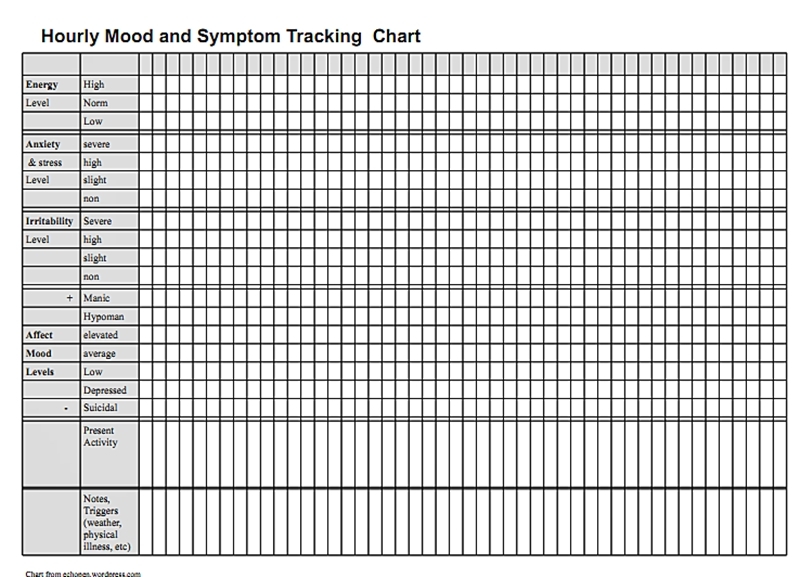 you may download this PDF mood chart for bipolar disorder if you wish, freely. 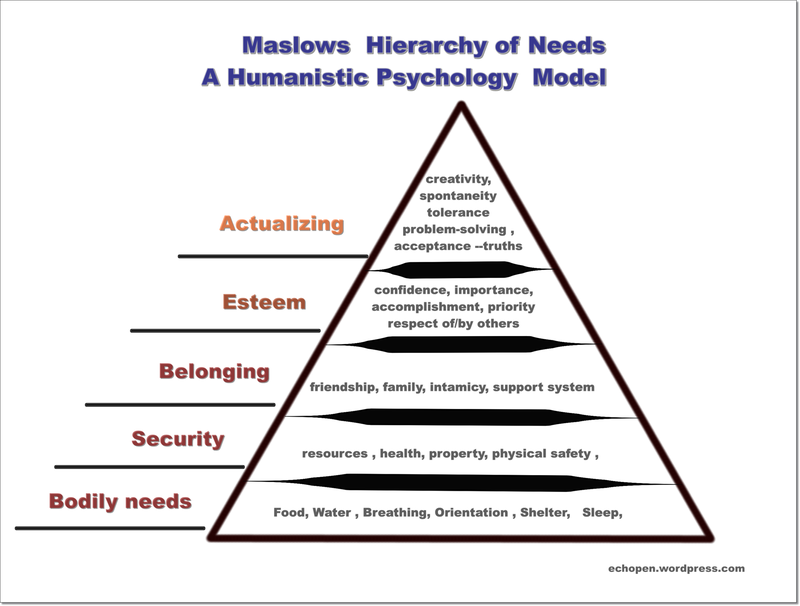 When i worked the phones , one of the useful templates was”Maslows Hierarchy of Needs”. This is a loose diagram on the basic structure of personal needs a person maintains as he/she moves towards “personal actualization” or growth and social productivity as Maslow saw the individual. 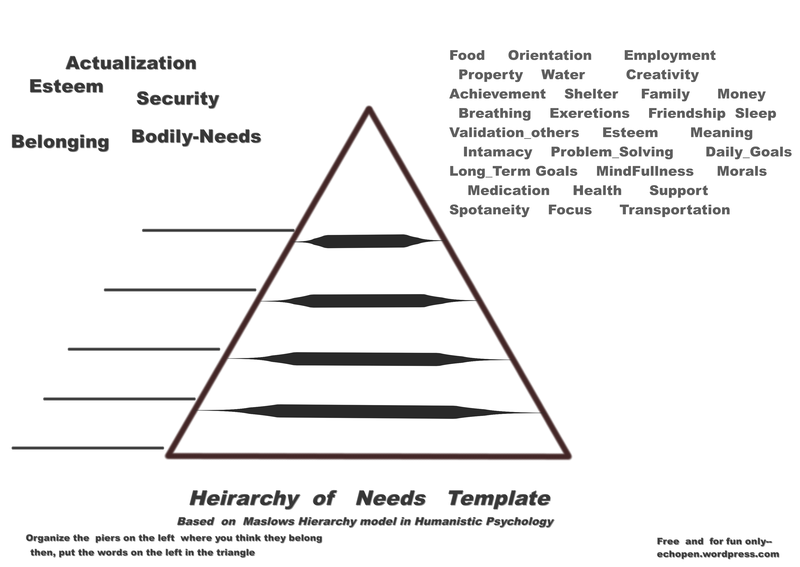 The real motivation of this diagram ―published with Motivation and Personality often taught diagram in psychology classes , was to suggest a foundation of “needs” were to be discussed when studying the potential of the individual and the transition to actualization of positive accomplishments in family, community, ecosystem, etc. As one might expect ― an actual diagram for each person would differ a bit from person to person… this point- has even been debated in psychology articles over the decades. if it was clear the calling -person was in crisis, i would sway the “client” to focus on his basic needs. try to get them to focus one the tenant that needed addressed the most at that moment. am i responsible to myself (or even others, arguably) by taking care of my own tenants? right click to download. No Warranty . its a little like decorating a Christmas tree! I would like my first post of this year to be another feeling.. or emotion tracking chart. Your excited… so am I (photo, right). I am glad that the Daily Emotion Chart for Special Needs Children has been relatively well received, since I first posted it , years ago. But I think emotions charting or tracking can be useful for more than just children. For adolescent boys and girls and adults, managing mental disorder or just having trouble expressing their selves confidently, a emotion chart tool can be just as useful. working on Emotional grammar It can never hurt anyone, of any a age. 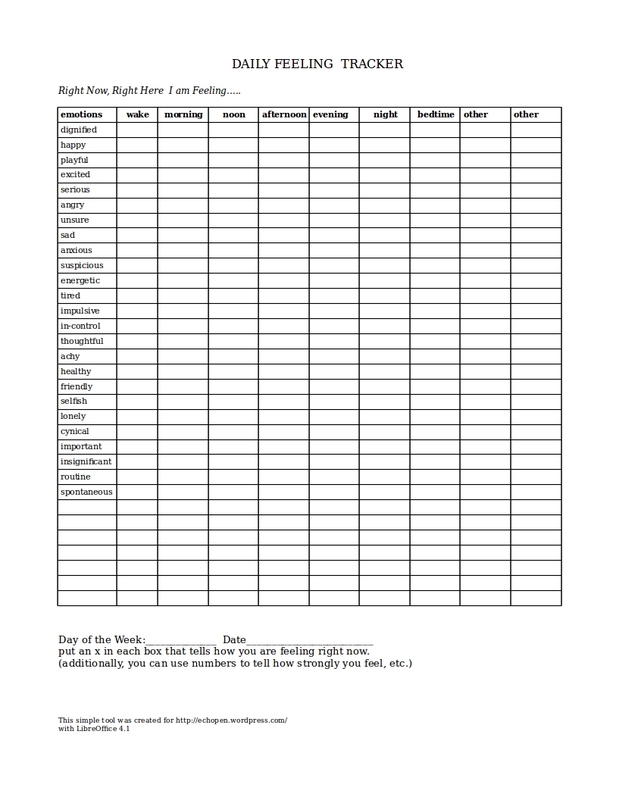 The emotion tracking chart (the one tagged for children that I have posted previously) could be used by anyone at any age, or expanded upon… but I had to give it name (for the search engines of the interwebs); and it was based on a previous experience with a friend and her childs needs . So I am adding another example of a chart for emotional vocabulary. My theory is (and I certainly don’t think I’m alone in this thought) that one can learn to make most of his or her own personal management tools; by customizing them for his/her own needs; or the needs of themselves with peers, support, communicating to their doctors etc. The creativity and control that comes with personalizing and maintaining one’s own toolbox only serves to build confidence and command over health management, IMHO. PDF version (readable with Adobe Reader, etc. ): DailyFeelingTrackerPDF..
For more Tracking charts please check out the “Charts” tab above. This is a quick revision of post: “Daily Emotion Chart for special needs kids.” the chart is deliberately simple following the K.I.S.S method. Although it was inspired to help a child with special needs, anyone could use it modify it or make their own. 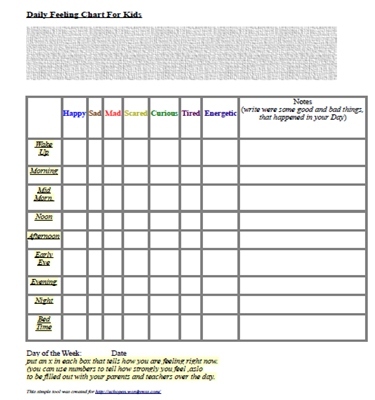 The next post will feature a new simple feeling chart or tracker that is better suited for adolescents or adults. Now, I have to go shovel Snow, have a great day! I suggested having him fill out a mood chart to aid in comparing his behaviour with affect over time. Somewhere I found an hourly mood chart on the WEB, downloaded it, and made some copied her. I found out a couple months later, That the teachers at the school were actually sitting down and filling out the chart with her son. My friend was filling it out the chart at home as well and sharing with case workers and her child’s psychiatrist. It was the simplest tool that helped aid a child to communicate what he was feeling to his teachers, his mother and his professionals. A simple aid to help people get on the same page. Sadly I cannot find the mood chart I downloaded back then, so i thought I’d take the time to create a simple new one. It gives a child a chance to do something many are just afraid to do…Voice what they are feeling. Express themselves confidently. but since i make no money for making charts, well my chart is simple. A download is also available on the Charts Tab of Pennsylvania Echoes Blog. The new formats include Doc(MS Word) ODT (Writer) XLS (Excel) in addition to the previous PDF version. 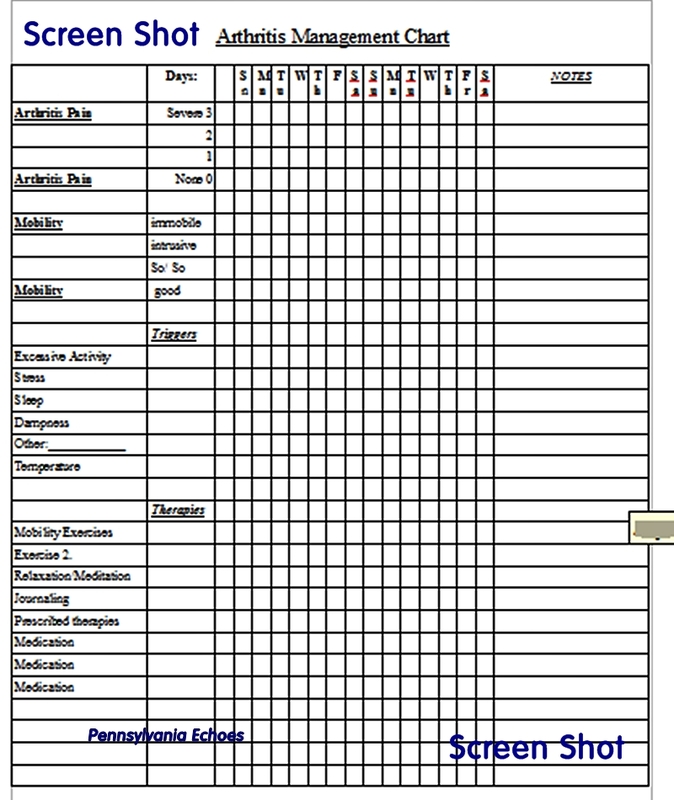 Arthritis Pain Management charts are a handy way to study triggers and pain symptoms for ones management with his doctor or health care professionals. Simply fill out the chart once a day. The downloads are free for use… as is. Sorry. Libre Office/ Open Office spreadsheet format not available right now. More Charts are available on the Charts Tab on the menu above. 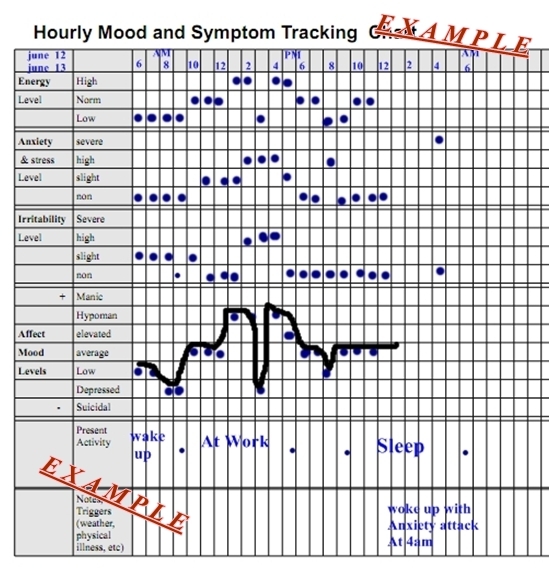 Mood charts and symptom charts are simple tools for tracking symptoms over along period of time. But many mood disorder managers may experience intrusive mood fluctuations or other symptoms (anxiety for example) in shorter periods of time. In any case, rapid cycling of moods can be debilitating, making it difficult to function through ones daily life. I thought it might be helpful to create a downloadable chart for tracking moods and symptoms hourly, or over intervals over a day. This mood chart is for those who are trying get a handle highly fluctuating moods. So I made a simple chart for tracking mood and symptoms hour by hour if necessary. the left thumbnail is a view of this chart. the right is an example of what one might look like filled out. The chart has enough columns to chart 48 hours. Since charting hour by hour may be a bit tedious for ones needs , the top row is left blank so one could label the time slots that suits them best. 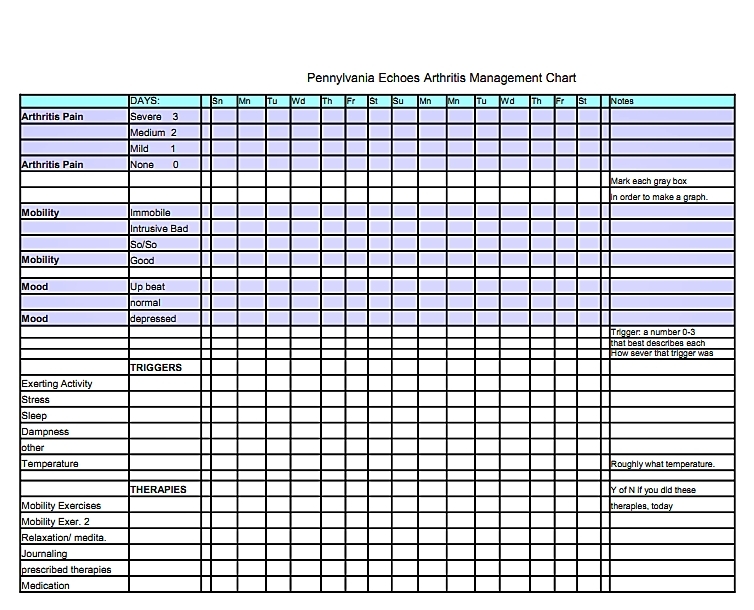 Also the chart available in MS doc format and Open Office odt (writer format). As always these charts are to encourage your own creativity in making tools in wellness management.